This page is about the Japanese naval fighter A6M5 otsu. For other uses, see A6M (Family). The A6M5 otsu is a rank III Japanese naval fighter with a battle rating of 4.7 (AB/RB) and 5.0 (SB). 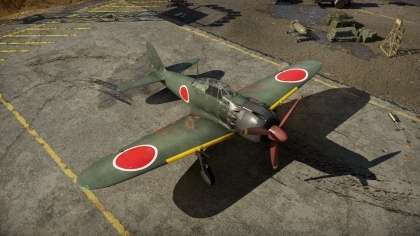 This fighter was introduced in Update 1.37. Being the last version in-game of the famed A6M "Zero" this aircraft is not only a continuation of the classic series but also a major improvement. It differs from other versions of the A6M in several ways - for one, this is the first version with armour in both the pilot's seat and the windscreen. In turn, this version of the A6M is inherently heavier, making the aircraft more sluggish in turns and manoeuvres. Another major upgrade from past A6M models is a 13.2mm Type 3 Browning-derived machine gun placed on the right side of the engine cowling. This gives the A6M5 otsu a fighting chance if its cannon ammunition is expended. Also featuring a pair of Type 99 mk 2 cannons and a 7.7 Type 97 machine gun, the A6M5 otsu is heavily armed for a fighter its size. The A6M5 otsu's armament is an upgrade from previous "Zeroes". It features two Type 99 mk 2 20 mm cannons with 125 RPG along with 7.7 mm and 13.2 mm machine guns. Gun convergence is best set at 400 meters or less, as most engagements are in very close quarters. Stealth is easily the best belt for the 20 mm cannons as it is composed of high explosive rounds and API shells. Universal works If you have trouble leading the shots. Stealth or Universal belts work for both the 7.7 mm and 13.2 mm machine guns. If attacking armoured targets such as landing craft, use ground targets belts. Similar to past "Zeroes" the A6M5 Otsu is a proficient dogfighter. With a turn time rivalling biplanes this aircraft is more than capable of winning any standard turning fight. It encounters problems at both high speeds and high altitudes, where its foes excel at. Generally speaking, the A6M5 otsu is best utilized as a low-altitude low-speed dogfighter. It can be a great addition to a team especially if paired with higher speed Japanese aircraft such as the Ki-61 or J2M3. When flying the A6M5 otsu, remember to keep your speed low and to never engage in head-on attacks. Although the aircraft has a 45mm armoured glass plate in the windscreen, its main armament is not centrally located in the nose and thus will be at a significant disadvantage. "Bait" enemies by making them think they have a successful shot on you and then dart away to a lower altitude. This will most often result in either kind of scissors or a standard turn fight, where the A6M5 otsu excels. Once able to be destroyed, get as close as possible to the enemy aircraft and fire in short bursts. This way, ammunition will be conserved and the enemy surely destroyed. Be careful not to go too fast, as the A6M5 otsu's control surfaces lock up making it incredibly difficult to manoeuvre. Although the A6M5 Otsu is a fantastic fighter as far as manoeuvrability goes, its speed is not on par with the enemy aircraft it faces. Both the P-51 and the F4U can outrun the A6M5 Otsu. In a situation where one is being Boom & Zoomed (enemy aircraft is using superior speed and dive attacks) call upon teammates for assistance. There is little an A6M5 otsu pilot can do against an enemy with superior speed. 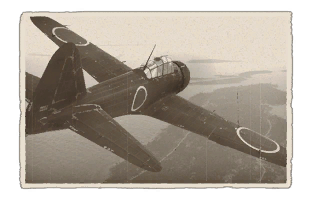 The A6M5 otsu is best used as a support aircraft as it is generally unable to destroy some of the aircraft it faces. Staying with other teammates is a sure tactic and will net you the best results. A "Zero" pilot must always recognize the need for teamwork and communication. One can also play the A6M5 series as a light boom and zoom aircraft, using the climb rate to get above the competition, and the improved dive capabilities over the M2/3s to swoop down onto enemies from above, but be mindful of your speed. The A6M5 otsu's biggest downfall is its speed. Start by unlocking performance upgrades as the stock armament options are easily workable and viable. Unlocking performance modules such as Engine and Engine Injection will also shorten turn time. Once all the performance modules have been unlocked obtaining the rest of the modules is fairly easy. The A6M5 Otsu was a modification of the earlier A6M5 series. It utilized the A6M5 Ko's Type 99 mk 2 cannon modification as well as thicker wing skinning, allowing for higher dive speeds. The A6M5 Otsu was the first variant of the A6M series to utilize armour protection. It was produced from April 1944 through October 1944. Skins and camouflages for the A6M5 from live.warthunder.com. This page was last edited on 3 April 2019, at 16:31.